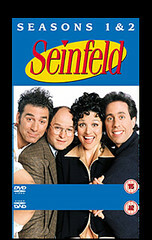 How could you have an entire night at a baseball game dedicated to the TV show “Seinfeld”? It seems like a promotion about nothing to many people, but it was one of the most sophisticated, entertaining and best-executed events I’ve ever seen at a Major League Baseball game. Beginning with the promotional cap carrying the Seinfeld insignia handed out to the first 25,000 fans, the Mets made a good impression. The cap is comfortable and good looking even with the logo on the back. And it’s not a bad association for most Met fans – the show is popular because we like it, and as New Yorkers especially, we identify with it. WPIX is also a sentimental favorite for this sort of rerun. When the Yankees were on the station in the 70s, The Odd Couple and Star Trek would sandwich the games to our collective delight. Meanwhile, WPIX kept the focus on the program itself with grace, showing hilarious clips between most innings. When a trivia contest involving the “Soup Nazi” character was answered correctly, the scoreboard showed the actor who played him coming out and giving the fan their dvds personally! In the 7th inning, the announcer introduced Jerry Stiller himself to sing “Take Me Out to the Ballgame.” It was a great rendition too (video after the jump!). To top it all off, when the Mets took the lead on an Ike Davis homer, the scoreboard cut to a clip of Elaine’s embarrassing dance at her office party. The Mets carried their weight by beating the Dodgers in a see-saw battle that saw the end of Andre Ethier’s 30-game hit streak. It was an uncommonly great night of baseball and multimedia marketing synergy and I would like to congratulate the Mets and WPIX/Seinfeld marketing department on a job well done.